* Received from publisher for review. John Stephens' aptly-titled new fantasy trilogy begins auspiciously with a nimble, fast-paced tale of three siblings. Kate, Michael, and Emma have suffered through ten years of odious orphanage "care"; now they have slipped into the care of the eccentric, disturbingly mysterious Dr. Pym. While exploring their new home, the children discover a magical green book. With that discovery, a decade of tedium dissolves into cascades of dangerous time travel adventures and struggles with a beautiful witch and decidedly less attractive zombielike Screechers. High early reader marks for strong characterization and battle scenes. Admittedly, when I think of books involving siblings, A Series of Unfortunate Events by Lemony Snicket and The Chronicles of Narnia by C.S. Lewis immediately spring to mind. In part, I was afraid that it would drift too closely along those lines and I am pleased to say that it was unique. Siblings Kate (the eldest), Michael (the middle child), and Emma (the youngest) have been whisked away from the safety and comfort of their own home to be protected from the darker forces that are after them. As a result, they've been moved from orphanage to orphanage before finally landing in Cambridge Falls--and the home of Dr. Stanislaus Pym. I loved the setting of Cambridge Falls and its initial lack of inhabitants as well as watching the town's history play out. But more about our three main characters. Kate is the eldest and as such, is responsible for her siblings. She's level headed and has a bad habit of saying "yes" when her siblings ask her for anything--even when it's not the greatest of ideas. Michael is the middle child and rather bookish at that; he absolutely adores dwarves and this serves him well. Also, he likes to photograph things. Lastly, we have Emma and honestly, she often annoyed me throughout The Emerald Atlas. She's very headstrong and will often pick a fight. However, on the upside, she is extremely loyal. Through the past, they also meet Gabriel, a massive man who is a fierce warrior from a village in the mountains and the Countess, a powerful witch who is after the Atlas (and uses French phrases on occasion, although she claims she's Russian). Along with the Screechers (named such by the children of Cambridge Falls although their real name is the morum cadi) she seeks the book by holding the town's children hostage and forcing the men of Cambridge Falls to look for it in the Dead City. The dwarves were a pleasant surprise, I must say. They weren't the cantankerous drunks that I think of when I picture dwarves; they were a much neater, more respectable group and well, funny! Admittedly there is one drunkard in the group, but this particular bad apple isn't enough to spoil the bunch. I found the prologue to be a bit slow, but things certainly pick up once the children arrive in Cambridge Falls. The Emerald Atlas is set in a world rich in detail and magic; it'll grab hold of you and it won't let go until the story wraps up. 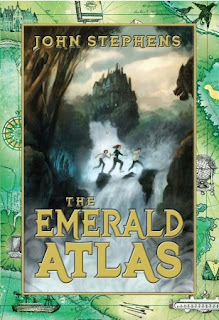 Yes, The Emerald Atlas has a definitive ending as it does deal with the first of the three Books of Beginning. Needless to say, I'm looking forward to reading the next installment to this series and if you're intrigued by the summary, I'd suggest picking up a copy to read! Honestly though, it's the sort of Middle Grade book that even us big kids can enjoy! Great review! I had seen this book and been wondering about it; I had same thoughts as you about the "siblings in trouble" motif becoming too familiar. Thanks for the insights.